Ivoriona (#5), under jockey Jorge Torres, holds off PHQ Goodbye Earl (#7) in Speedhorse Graham Paint & Appaloosa Derby(G1) trials opening night at Remington Park. OKLAHOMA CITY, OK�MARCH 10, 2017�Ivoriona turned the tables on her nemesis Friday night when she defeated PHQ Goodbye Earl by a head in the first of two trials for the $46,900 Speedhorse Graham Paint & Appaloosa Derby(G1) opening night at Remington Park. The last time this duo faced each other at the Oklahoma City racetrack, on June 4, 2016, they ended as dead-heat winners of the 2016 $239,000 Speedhorse Graham Futurity(G1). Tonight (Friday), the talented pair ended with the top two qualifying times. Under jockey Jorge Torres Ivoriona cruised over the 350 yards in :17.532 seconds, into a 10-mph crosswind, to get the top qualifying spot for the Speedhorse Graham Paint & Appaloosa Derby(G1). Ivoriona, the regular registry 2016 World Champion Paint, ended her 2-year-old year of racing on a two-race win streak when she won the Grade 1 $94,700 Speedhorse Paint and Appaloosa Futurity at Lone Park. The daughter of leading Quarter Horse stakes sire IVORY JAMES broke her maiden in her career debut at Remington Park a year ago, setting a new 250-yard track record for Paints in the process. Owned by Mickey Johnson and Randy Hill of Lexington, Okla., the bay filly out of Friona, by Texas Hero, is trained by Stacy Charette-Hill. 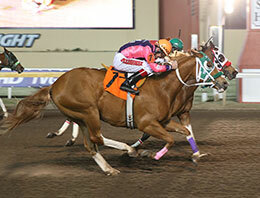 The winner of six of eight starts has banked more than $131,400 in earnings. The 10 fastest qualifiers will return to Remington Park on Saturday, March 25th to vie for the winner's share of the rich purse. For the complete list of Speedhorse Graham Paint & Appaloosa Derby(G1) finalists, their times, sires, dams, owners, breeders, trainers and jockeys CLICK HERE.